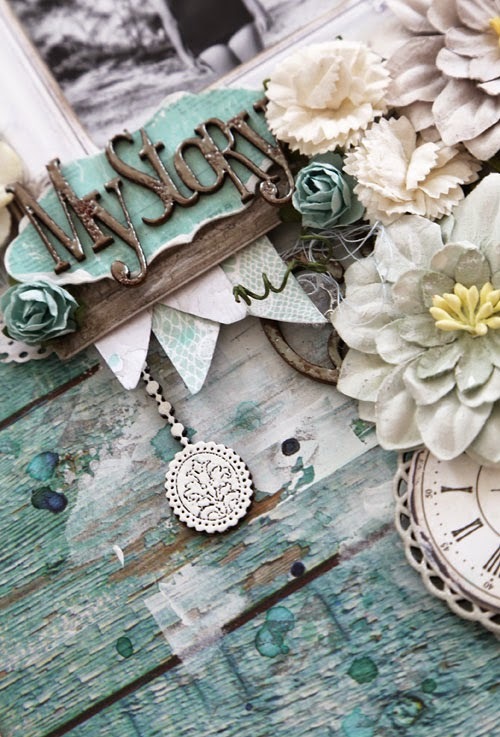 Hi everyone, today I have some Your Creative Wings inspiration for you! I'm really fortunate to have a bunch of really old photos of my family, and mostly because of my Grandparents I also have the background story that goes along with them. I love that family members who have gone before me, each in their own way help to shape my own life story. A photo of my Grandma in her youth (in quite a revealing swimsuit for the era gasp!) 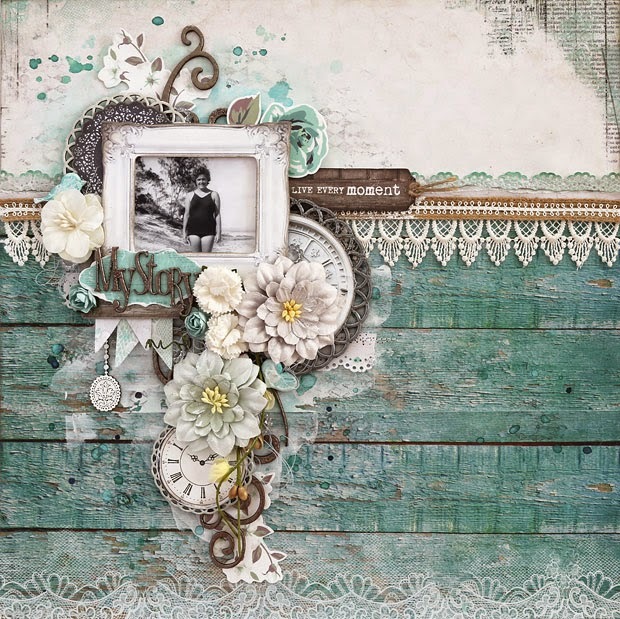 inspired this vintage layout. 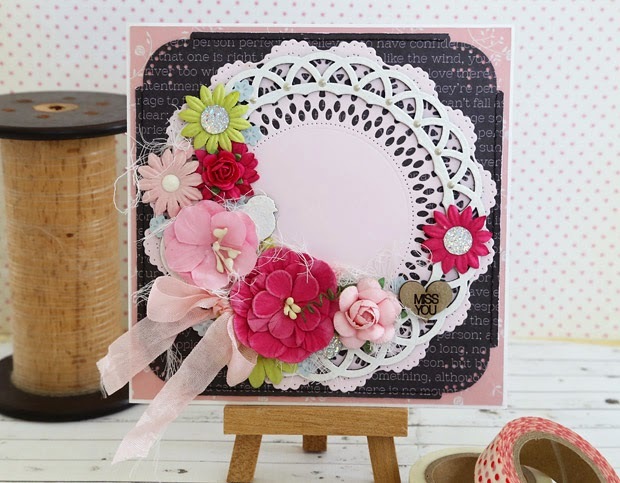 I'm totally loving the Doilyz Nest chipboard set which comes with 6 individual pieces. 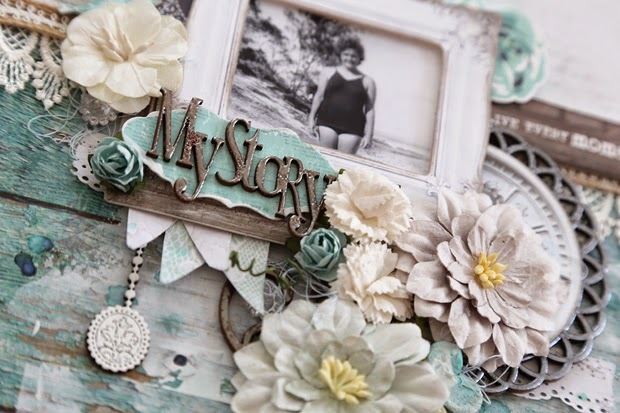 In this layout I've used three of them and layered each with ephemera pieces. I've recently purchased a set of Tinby Metallic Melts and thought I'd give them a try on this layout. 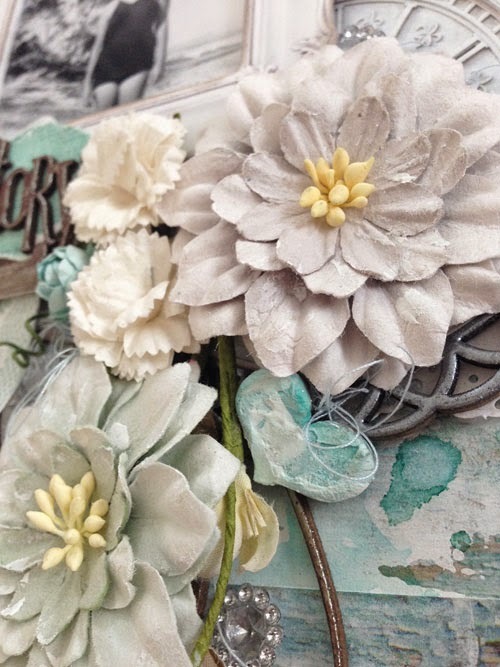 Tinby Metallic Melts are a chunky heat embossing powder with a metallic sheen. I was aiming for a rustic finish, and as you can see on my title it gives a lovely aged look. To achieve this look simply heat the powder until almost melted, but not completely. I used three different colours throughout the layout, on the Doilyz Nest pieces, the large flourish and on my title. The tiny pendant has so much detail to it, and when embossed with white embossing powder it shows that detail through beautifully. It's great to keep some smaller pieces of chippy on hand to tuck in here and there to add extra details, like the Birds - Cute set and Hearts & Arrows set. I've applied Whipped Spackle roughly with a palette knife, allowed it to dry and then dripped mist onto each. When the mist dried I dabbed on a little more gesso for a mottled effect. I've also created some cards this month. Do you have anyone in your life that you wished lived closer so that you could see them more often? Why not send them a card to remind them how much you think of them? The Love Candy buttons have some sweet sentiments on them and this little 'Miss You' sentiment is so darn cute. I've used another of the Doilyz Nest pieces, heat embossed in white and layered it over a die cut doily to create an additional layer (the Doilyz Nest pieces are so versatile!). After arranging my flower cluster around the bottom left I've dabbed Liquid Pearls around the remaining inside border of the chippy. I've again tucked a little Birds - Cute piece in with the flowers (heat embossed in white), and the Love Candy piece has been left raw to give it some contrast to the rest of the card, and draw your eye to it as the sentiment. Your Creative Wings Products Used: Love Candy YCW12018, Birds - Cute YCW3002, Doilyz Nest YCW13005. Other Products Used: Patterned Paper - Kaisercraft XO collection, Bazzill cardstock, Martha Stewart corner punch, Cheery Lynn Designs doily die, Carl punch, Flowers - Green Tara, Petaloo & Manor House Creations, Prima Say it in Crystals, My Minds Eye enamel dots, Doodlebug Designs sequins, Liquid Pearls in Platinum Pearl, white embossing powder, thread, satin seam binding, medical gauze. And lastly a card just to say "Love You". Valentines Day has been and gone, but it doesn't hurt to remind our loved ones every now and then how much we appreciate them. 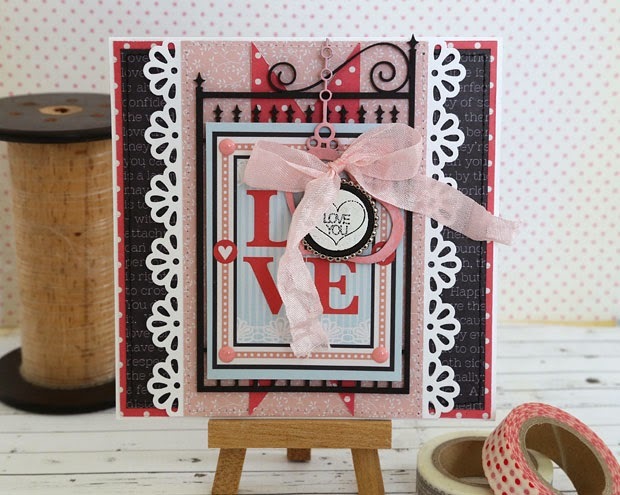 I was inspired by the Art Deco feel to this 3x4 card from Kaisercraft's XO collection. With this theme in mind, flicking through my chippy pieces I was drawn to the styling of the Ornate Gate Medium chippy piece. I painted it with Tim Holtz Distress Paint in Black Soot for maximum contrast to the 3x4 card. To continue with the Art Deco theme I've edge-punched some white cardstock and used it as a border. The Love Candy pieces were the perfect size to replace the letter "O" in the word Love. I've separated the very outside piece of the Love Candy and painted it as I did the gate, and the inside two pieces were then heat embossed in white. Once reassembled they fit perfectly into a 25 (or 2.5cm) Epiphany Crafts Charm Setting. This then nestled into a Heart Chain chippy piece that I painted with pink acrylic paint. Other Products Used: Patterned Paper - Kaisercraft XO collection, Bazzill cardstock, Martha Stewart edge punch, Tim Holtz Distress Paint in Black Soot, white embossing powder, My Minds Eye enamel dots, acrylic paint, Ephipany Crafts Charm Settings 25, satin seam binding, machine stitching. Thanks for dropping by today, and don't forget about our special offer at the moment - spend $25 or more in the YCW Shop and go in the draw to win $100 worth of Your Creative Wings chipboard!! 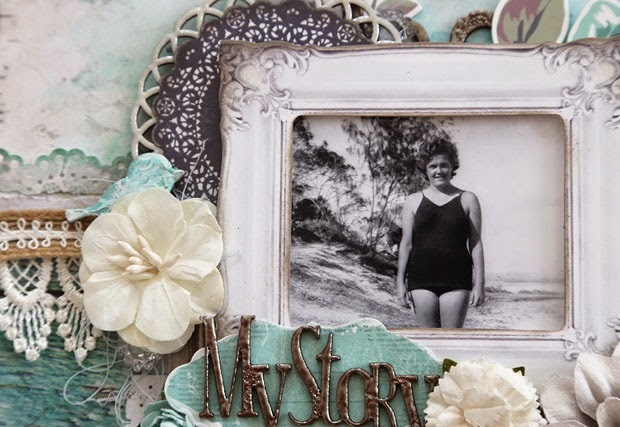 Hi Jodie - I came across the layout of your grandmother on Scrapbook.com and wanted to let you know I think it's beautiful. 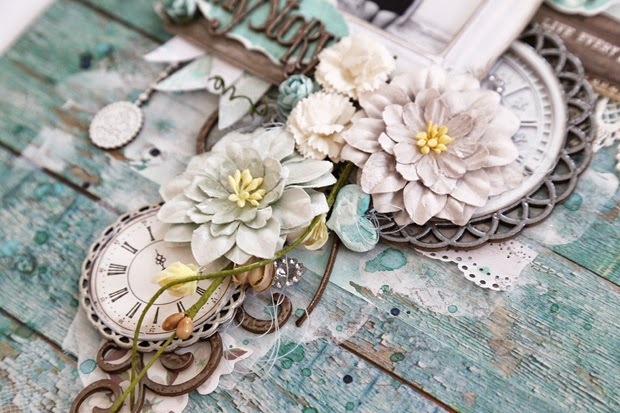 I love the design, the color palette and the way you treated your chipboard pieces. Just stunning! Thanks so much Kathy! It's hard to beat turquoise and woodgrain isn't it, one of my favourite combinations, something so beachy about it.